Putting the disappointment of not getting to race at Barbagallo Raceway behind him, Touring Car Masters’ racer Adam Bressington is in eager anticipation for the third round of the series at Hidden Valley. His Bandit Chippers Holden Monaro HQ has had a complete engine refresh and is now raring to go for this weekend’s racing. The season had started out on a solid note at Sydney Motorsport Park with an eighth, a third and a seventh in the three races on the Top Gear Festival extravaganza. “Considering it was our first time out in the car and I haven’t raced for five months, I thought we put in an accomplished effort. “John ‘Barrell’ Pachos and his Hi-Tech Motorsport team did wonders getting the car ready . . . and it didn’t miss a beat all weekend,” said Bressington. That was a far cry from what would transpire for round two in West Australia. Bressington had to pull out of the event during the week leading up to the Perth races due to engine issues with the Bandit Chippers Holden Monaro HQ. “That was to be my second trip (from Sydney) to race in there and for the second time I didn’t get to do a lap. It was very disappointing,” Bressington said. successfully. Ironically it was Johnson at the wheel of the Monaro when the engine suffered a broken conrod in testing. The engine was rebuilt over the next few days with parts freighted in, then midweek when it was put it on the dyno, the engine grabbed a piston in the very sleeve that was damaged from the original blow up. “We tried to borrow an engine with no luck,” Bressington related. The Perth round was very hard on the Touring Car Masters field with half a dozen other cars suffering similar engine dramas. “We are back on track now though. Last week the engine was rebuilt, fired up and then put on the dyno. Last Friday the car was loaded up on a truck and sent on the long haul to Darwin,” Bressington enthused. 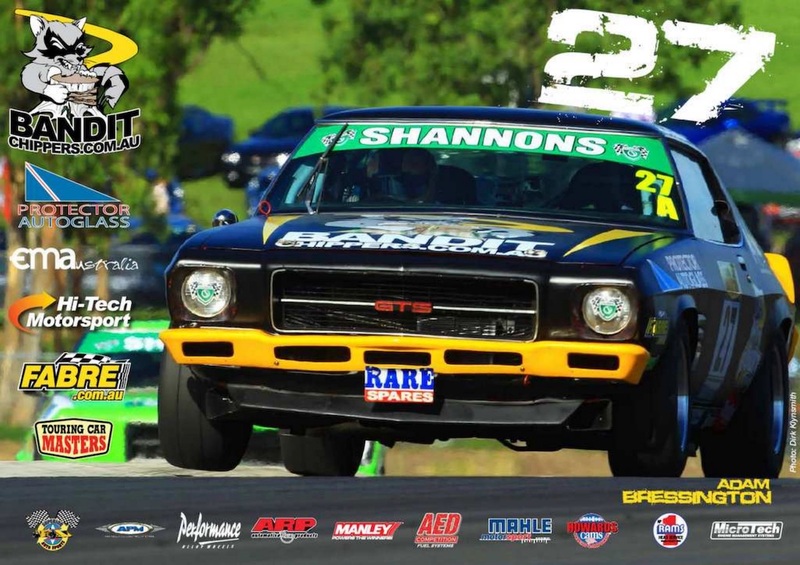 The team also acknowledges the assistance of Bandit Chippers, Protector Auto glass, Engine Master, Fabre, Manley Performance, Howards Cams, AED Performance Fuel Systems, Australian Performance Machinery and Performance Wheels.